We’ve covered a bunch of different sales over the past few weeks that focus on smart plugs. 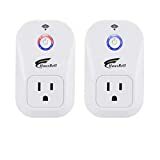 These little boxes plug into any standard wall outlet, and then you can plug anything you want into the box like a fan, lamp, coffee maker, or even an air conditioner. Whatever you plug into the smart plug instantly becomes controllable using an app on your smartphone. Or, even better, it becomes controllable using Amazon Alexa. As many different smart sales as we’ve seen in recent weeks, the best bargain is still Amazon’s sale on a 2-pack of HAUSBELL Smart Plugs. The $39.99 price tag drops your cost per plug to just $19.98, which is a price that no comparable smart plug can match right now.